We can confirm that Petr Cech will make a return for Arsenal against Blackpool United in the Carabao Cup fixture on Wednesday night. The Czech international and Arsenal number one has been missing since sustaining an injury in the first half of the Gunners' 2-0 triumph over Watford back in September. In his absence, Bernd Leno has been outstanding in goal but the 36-year-old veteran is on the verge of taking back his place between the sticks by the time we fight it out with our opponents tonight. 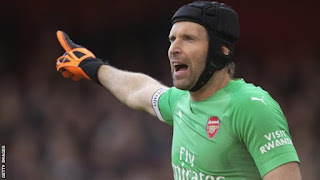 The return of Petr Cech to the first team was revealed by Unai Emery who addressed the press ahead of the crucial encounter. "In each moment for each match, we are going to give the goalkeepers the opportunity to help us," said Arsenal manager Unai Emery. Elsewhere, Ainsley Maitland-Niles has recovered from a leg fracture and is in contention for selection. Hector Bellerin is a big doubt for the game as he is battling an injury which may as well keep him out of Saturday's big one with Liverpool. Nacho Monreal and Sead Kolasinac, our two left-backs, are nearing full fitness after both spending time on the sidelines with hamstring problems. The latter has resumed training with the team but tonight may be too early for him. Laurent Koscielny is still working on his fitness too and when he will appear for us again is unknown.